I'm guest posting over at Sew Sweetness today as part of Sara's Sewing Back-to-School, a 30 day series sharing some helpful sewing articles from a bunch of terrific bloggers. Today I'm sharing a post on the importance of maintaining proper seam allowance. Head on over to Sew Sweetness to check it out. Hi Gwen..lovely to see you back here! I really felt for you not having power during the last week. The whole experience really lets you know how small and fragile our lives really are. How unusual for both of us to go through this kind of experience within a year of each other! I really appreciate your mum letting me know how you were and emailing me. I hope you're having a much better week this week! I learned very quickly when I started quilting that exact 1/4" seams are critical... amazing how quickly a 1/16" here and an 1/8" there adds up! Great post Gwen!! It has good demonstrations. Great post! And thanks for directing me to such an awesome blog! 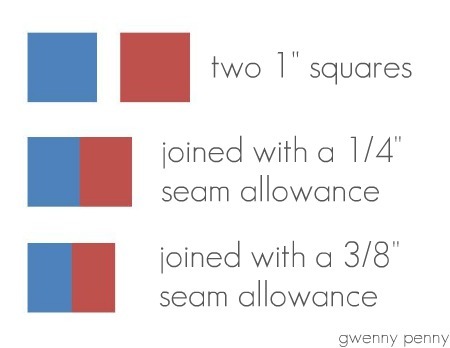 This was a great post Gwen! Wonderful illustrations and terrific explanations. You're pretty amazing.